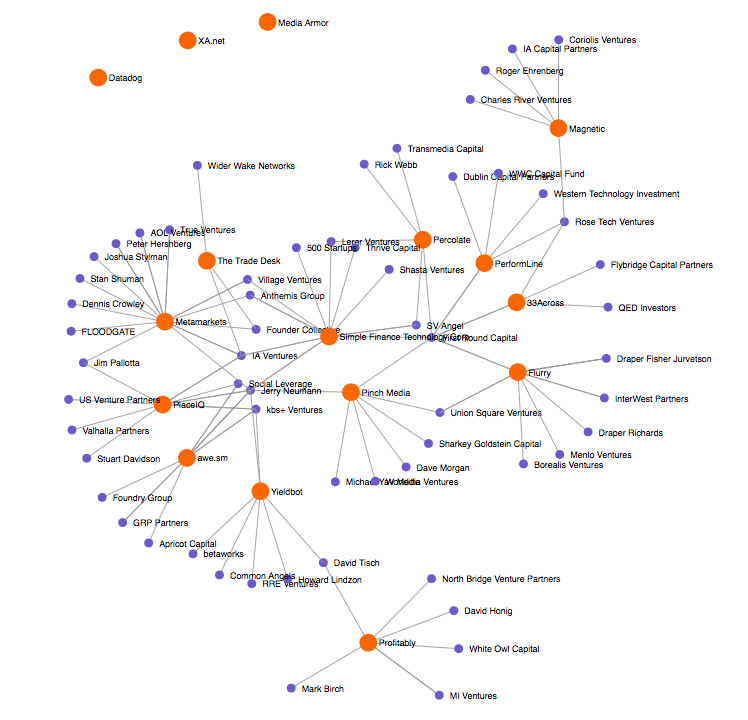 A friend asked me last week if I knew a tool to help him visualize which VCs were investing in a sector. I did not. But I realized I could pretty quickly repurpose the VC Bar Chart code and some unpublished code that pulls in data from a Google spreadsheet to show a force-directed graph. So, weekend project. Data from Crunchbase, visualizaton using the d3.js library. The site is here. Just start typing company names in the upper-left hand corner box and hit plus to add. Real name to Crunchbase permalink translation uses the list of companies as of Friday* or so, so if the company was added to CB later, autocomplete finds nothing; just type in the permalink and the company will still be added. In the screenshot above a few of my companies had no CB investor entries, so they’re just floating out there. Many of my other companies are not linked to me because CB does not mention me as an investor. 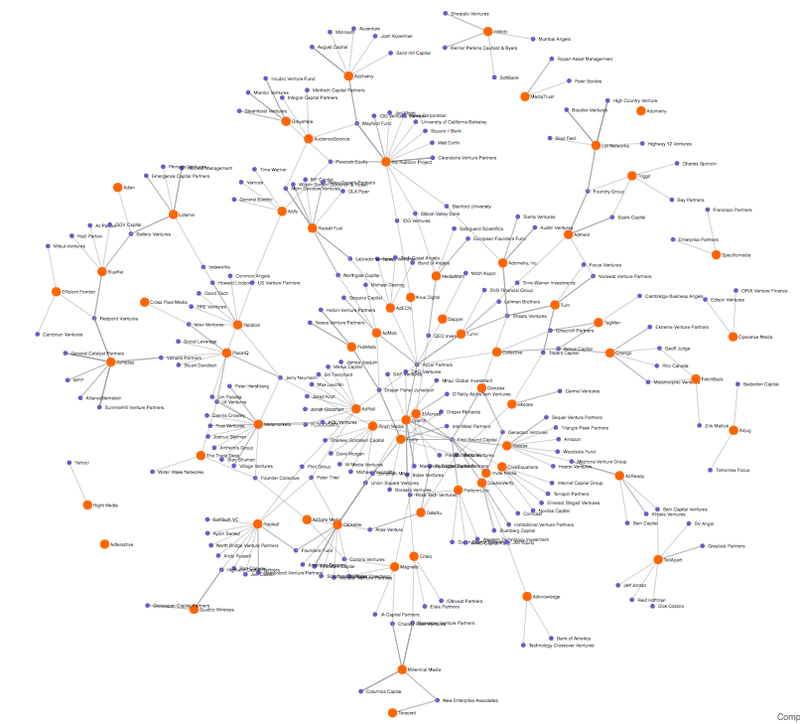 One way to explore is to enter a bunch of companies in your area of interest and see how the graph falls out. Here’s one of the AdTech industry. The save functionality is experimental (to me, that is.) It uses HTML5 localStorage. The caveat is that you can’t email visualizations around that way, and there may be times when your browser clears localStorage (sometimes when clearing cookies, for example.) If it does, you lose all saved visualizations. The code is all client-side, so it’s right there in your browser if you want to look at it. I found myself late last night using a non-analytical debugging process** when I was trying to get the ‘load visualization’ piece to work. I’ll put it up on GitHub some time after I clean it up. * And I redacted the list to only include companies that CB showed having investors. The full list was too big to load efficiently. ** Mainly making random code deletions. Jerry, this is fun to play with, and super helpful. Great utility! Very cool. ← You can’t manage what you can’t measure. Not at scale, anyway.